Released: November 14, 2014. Directed by: Peter Farrelly, Bobby Farrelly. Starring: Jim Carrey, Jeff Daniels, Laurie Holden. Runtime: 1 hr., 49 min. In 1994, ignorance was bliss for Harry Dunne (Jeff Daniels) and Lloyd Christmas (Jim Carrey). In 2014, it’s still endearing, and they maintain the same level of innocence but they are more obnoxious. They make arm fart noises and try to get the crowd to call the speaker a nerd at a sort-of TED talk. It misses, though the joke could be their harsh misjudgment of the situation. Harry (Jeff Daniels) is still the innocent one. Daniels is able to fall back into his character, even though he seems rusty until ten minutes pass. After twenty years, that’s expected. Lloyd still puts his needs before anyone else, dead or alive. Carrey is occasionally over-the-top, but he has a blast portraying the character. The film is kept alive by the actor’s chemistry when there are periodic, unfunny lulls. After twenty years, a Lloyd, who now looks like a hermit, is at a mental hospital. He’s upset about not getting with Mary Swanson and he has been sitting in a wheelchair with a blank stare into nothingness. It turns out, he has been joking this entire time to prank Harry. Harry needs a kidney and thinks he needs it from a family member and not just a blood type match. When he finds a letter from old flame Fraida Felcher (Kathleen Turner) that states she is pregnant, he sets off to find the daughter he never knew. And meanwhile, he can hit her up for a kidney. Lloyd is attracted to the daughter and decides to tag along. They find her in El Paso, Texas, after stopping in Maryland at her house. They meet her adoptive father and have to hand deliver an important invention that she forgot to bring. The pair get mixed up in a murder plot where they are one of the targets. It’s formulaic, but in the spirit of the original film. I can understand that the Farrelly brothers want to emulate the intense success of the original cult pleasure, but comedy sequels have proven time and time again that it’s difficult to recreate the magic twice. The writers actually repeat five jokes from the original. They largely follow the original’s premise to a tee and it disables any room for innovation because of that. Some repeated choices are charming – particularly the repeated song of the Apache Indian’s “Boom Shack-a-Lack”. It’s a pleasant, nostalgic moment. I do like some music decisions by the film’s composer, the band Empire of the Sun. Songs like Willie Nelson’s “On the Road Again” and Marty Robbins’ “El Paso” are obvious, but effective. They tie scenes together. Harry gets a fantasy sequence which depicts what type of father he would have been to Penny. Lloyd’s fantasy sequence is just as violent as the first one – where his fantasy of being with Penny mirrors his one with Mary Swanson. The defense of his girl’s honour is still creative. The daughter, Penny, portrayed by Rachel Melvin, is dumber than a doornail. Melvin can’t display much talent because she is give a character with very little depth. The character’s stupidity isn’t endearing – it is more often annoying. Lloyd and Harry treat Fraida Felcher with a distinct meanness, which just isn’t in good spirits. The joke is that the beautiful young woman experienced the reverse ugly duckling and changed into one. The Walking Dead’s Laurie Holden portrays a character named Adele who is married to Pinchelow. She doesn’t get any depth. She works with a sneer throughout but doesn’t get any laughs. Rob Riggle is the main villain. He plays two characters – a handyman named Travis and then his twin brother, Captain Lippincott, a military figure who has camouflage expertise. This enables cool displays of make-up and great attention to detail. When the film’s humour misses, it’s awkward – like a kid trying too hard to be funny. It’s frustrating when the Farrelly brothers take the joke too far, it’s like they don’t know the boundaries of utter grossness. They might be going for a shock factor but it’s unnecessary. The humour doesn’t have that shadow of intelligence behind the stupidity like the original. Much of the jokes don’t flow as well as the original because the plot isn’t quite coherent. The most negatively astounding thing about the film is that the entire narrative falls apart at the end within a matter of ten minutes. It’s frustrating because many plot aspects are forfeited for either convenience or for a half-assed joke. It makes the road to the end completely irreverent. It’s a creative decision that I will never be able to get behind. 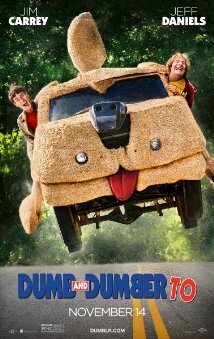 This entry was posted in 2014, Reviews # - M and tagged 2014, Apache Indian, Bobby Farrelly, comedy, Dumb and Dumber, Dumb and Dumber To, Empire of the Sun, Jeff Daniels, Jim Carrey, Kathleen Turner, Lauren Holly, Laurie Holden, Marty Robbins, Movie Review, Peter Farrelly, Rachel Melvin, Road trip, Rob Riggle, sequel, The Walking Dead, Willie Nelson by Daniel Prinn. Bookmark the permalink. I couldn’t face going to see this one. I didn’t love the first one so I think it would be a painful experience. Oh dear, if you didn’t even like the first, stay away haha! I wanted to like this, but honestly, I just couldn’t. Good review Dan.